Penwell Co. was formed this year “with the simple goal of making and selling a useful, attractive, and well-built product.” That product is the eponymous Penwell, a pen stand that “turns any pen into a desk pen” and not only comes in quite handy, but looks great at your workspace. 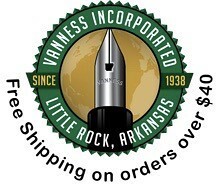 Based in Wallace, South Dakota and run by pen enthusiast Dan Keller, Penwell Co. is “Singularly Focused, Singularly Named.” The company aims to do one thing very well, and by this standard has not only succeeded but should have a bright future. The Penwell is ingeniously simple, and has only four parts: (1) the base, currently available in either walnut, aluminum, or brass; (2) an internal clip, which grips the pen; (3) a foam insert, which protects and pads the pen cap; and (4) a microsuction pad that adheres to your desk or other surface. The Penwell does not use any sort of adhesive, but rather thousands of tiny microscopic suction cups. The microsuction system works incredibly well. It stays put, and I’ve moved my Penwells multiple times without damaging the finish on my wood desk. To turn your pen into a desk pen using the Penwell, simply insert the pen cap-first into the foam insert until it’s fully secured. 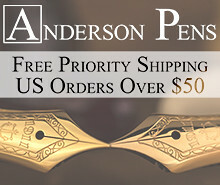 Larger pens and slip cap pens may require further adjustment, and Penwell Co. offers detailed use and care instructions on its website, including pointers on how to make these pens fit. For the record, I’ve had no issues with any of my pens not fitting in the Penwell, including larger pens like the Montblanc 146 and my Kanilea pens (which look absolutely gorgeous in the Walnut version). Kanilea Pen Co. Nui Nalu fountain pen in the Walnut Penwell. The Penwell matches the wooden box that comes with all Kanilea pens. The great thing about this product is that it creates versatility. I love desk pens, but I don’t like the fact that a dedicated fountain pen desk set has to stay parked on your desk all the time. I’ve had issues with the ink drying up from disuse. Penwell solves this problem by making it easy to grab your "desk pen" out of the Penwell and go - to a coffee shop or my downtown office, for example - and then re-park the pen in the Penwell once I get home. Another thing I love about the Penwell: it helps me out with those pens that won't post at all or are too long posted to use comfortably. (Parker’s Modern Duofold and Conklin’s Duragraph are two that recently crossed my desk.) I generally prefer to post my pens, in part because I have so much stuff sitting on my desk at any given time that I tend to lose track of caps or drop them on the floor. These longer, "unpostable" pens are perfect for the Penwell, which will hold the cap while I'm writing. Another problem solved! Many thanks to Dan at Penwell Co. for sending me these two Penwells and making this review possible. This is one of those well made, thoughtful products that makes you smile and which I have been using every day. Since the Penwell was released just in time for the holiday season, it made its way directly into my 2017 Holiday Gift Guide, and would make a great present for any pen enthusiast. You can purchase the Penwell directly from the Penwell website. The walnut version costs $49, the aluminum version $59, and the brass $89. These prices are more than fair, given the quality, originality, and obvious effort that went into finalizing and packaging this product. Disclaimer: Penwell Co. sent me the products featured in this review free of charge, for review purposes. If there's one thing I don't lack, it's pen cases, pen boxes, pen stands, and other storage options. Once you fall deep into this hobby, you become unnaturally preoccupied with the best way to store, carry, and display your collection. 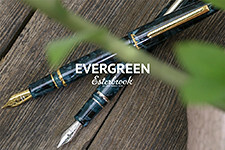 As interest in fountain pens and other high-end writing instruments has experienced a resurgence in recent years, companies have not only begun to product more pens and ink, but also accessories to go along with them. Aston Leather, Franklin-Christoph, Tom Barrington, and now Dee Charles Designs, all make some excellent leather pen sleeves and pen cases. In this review, I'll look at a black leather two-pen sleeve from Dee Charles that Ron at Pen Chalet was kind enough to send me. Each case features the Dee Charles Designs logo branded onto the front, and comes with the option of colored thread. I opted for red, of course. What's perhaps most notable about the Dee Charles leather pen sleeve is its simplicity. It's basically two pieces of black leather stitched together to form a pouch, with a line of stitching down the middle to divide the case so the two pens don't touch. Unlike a more expensive case such as those from Tom Barrington, the edges on the Dee Charles pen sleeve are left rough and unfinished. There's also no lining on the inside. To be honest, when I initially received this case, the leather felt extremely stiff, and I worried that it looked a bit "plasticky." You can see the unfinished edges and interior of this pen case, which I guess is appropriate for the rugged style as well as the price point. My initial impressions appear to be wrong, and this case has "broken in" nicely. While long-term durability remains to be seen, it's held up well over the past month (during which I've carried it every day) and the leather has definitely become more supple with use. Once it accumulates the creases and scuffs that naturally come with actually using any leather product, the unfinished edges and interior blend a bit and actually lend this case a rugged charm. On the left, a Montegrappa Fortuna in white/ruthenium, and on the right, my Sailor Pro Gear Imperial Black. The Fortuna is a relatively fat pen, and fits. Another thing I appreciate is that this double sleeve can hold two big pens fairly easily. At first, the fit was tight, but now that the leather has softened up it can easily hold a TWSBI 580 and my Kanilea Pen Co. Mauna Kea. The Tom Barrington case is a touch too short to hold either of these pens. This Dee Charles double pen sleeve is a sturdy option to protect your daily carry pens, and is available at an accessible price. Curiously, I've been able to find very little information about Dee Charles Designs as a company, and would be interested in learning more. 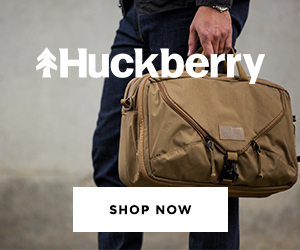 From what I can tell, they're new, and their product line is currently limited to one and two-pen sleeves and a pocket notebook cover. All three products are available in black, "sunrise" (tan), or rawhide leather, and you can choose colored stitching with red, blue, or gold thread to give your case a bit of character. I immediately opted for the black leather with red thread combination, and it's sharp. You can purchase Dee Charles pen cases from Pen Chalet, priced at just under $20 for a single pen sleeve, $25 for a double sleeve, and $50 for the pocket notebook case. 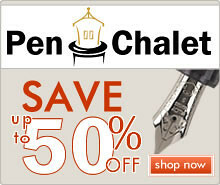 To sweeten the deal, for a limited time Pen Chalet is offering a free pen with your purchase of one of the Dee Charles cases. 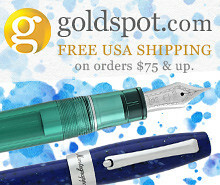 You will have your choice of a Lamy Logo, a Parker Jotter, or a Pelikan Belle ballpoint pen. Disclaimer: This product was sent to me by Pen Chalet free of charge for review purposes. This post contains affiliate links. Tom Barrington sent over this gorgeous dark brown ostrich leather pen sleeve for review. Tom Barrington Leather, based in California, makes a wide variety of leather goods and accessories, including pen cases, pen sleeves, wallets, and glasses cases. They were kind enough to send over one of their two-pen sleeves in brown ostrich, and it's one of the nicer leather pen sleeves that I've had the opportunity to review. I've tested a lot of leather goods, and this pen sleeve is extremely high quality. The pen sleeve arrived packaged in a white canvas bag with an embossed leather label and drawstring. I always enjoy seeing packaging like this - which reflects some thought - as opposed to generic boxes. The Tom Barrington two-pen sleeve easily fits two large pens. Pictured in this review are my Pilot Custom 823 fountain pen (a large pen my most standards) and my Sailor 1911 Black Luster. The sleeve is snug enough to hold your pens securely - they won't be falling out - yet it's not so tight that you can't deploy them easily. 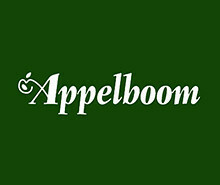 Tom Barrington sells directly through their website, and they also operate an Amazon store with most of their products eligible for Prime delivery. While the ostrich leather case featured in this review is not inexpensive, Tom Barrington offers a range of products at multiple price points. Cow leather sleeves start at $34, Stingray leather starts at $80, and Ostrich at $119. I have a thing for brown crocodile grain leather, so I'm eyeing one of these glasses sleeves next. Thanks very much to Tom Barrington for sending this over for review, and for sponsoring The Gentleman Stationer! Disclaimer: Tom Barrington provided me with this product free of charge for review purposes. This post also contains affiliate links. The attention to detail at the price point is impressive. The "Designed for Arrangement" logo is understated and attractive. In the market for versatile, low-cost pen and writing/art supply storage, Lihit Lab remains a popular option. I don't know much about the company - information is sparse but it's been around since 1938 and is based in Osaka, Japan. Their cases rarely top $15, come in a standard - if a bit uninspired - range of colors, and are good enough quality to hold up to the demands of most people's daily use. About a month ago, I acquired two Lihit Lab cases to plug some holes in my daily carry arsenal. One was a huge hit; the other a major fail. The Lihit Lab Bag-in-Bag portfolio/organizer has quickly made found its way into my daily work carry, and sometimes even on the weekend. I love portfolios. I consider them to be one of the most practical bags to carry on a daily basis. I've had several in the past, but I tend to wear them out so quickly I have a hard time spending money on nice cloth or leather options. Enter the Lihit Lab "Bag-in-Bag." The purpose of this case is twofold. The Bag-in-Bag can serve as a standalone portfolio, holding a computer and/or tablet, one or two writing pads (up to legal size), your phone, chargers, notepad, and a few pens. Basically, anything you need for an afternoon of business meetings or a morning working at the coffee shop. It can also serve as an easily swappable insert for a backpack or briefcase, which comes in handy if, like me, you're someone who regularly rotates between the two. At the $13-15 price point (depending on the color you select), this is really a no-brainer if you're looking for a portfolio and don't mind canvas over leather. The material isn't as nice as the cordura used by companies like Nock Co., and this Lihit Lab bag probably won't hold up forever, but it's good enough for my needs right now. The one draw back is that it stains and shows dirt very easily. Whatever material they use isn't coated and is highly absorbent, so the case has picked up dust, dirt, etc. when I've worked at coffee shops and outside on my patio. With the brown version this probably won't be as much of an issue, but be warned if you're considering lighter colors such as the orange or light green. For those of you who like oversized fountain pens, take note that the pen slots on this case are fairly tight and shallow, so big pens don't fit. You can carry a lot in this case. Here, I have a Nock Co. Sinclair stuck in the side pocket, as well as a Pelikan M205 Blue Demonstrator and a Rotring 600 mechanical pencil. Both fit perfectly in the otherwise snug pen slots. I use the larger 10" x 13.8" (A4) version ($15 via Amazon), as opposed to the smaller 7.1" x 9.8" (A5) case ($11 via Amazon). The larger bag-in-bag easily holds my 12" Macbook and/or my iPad Pro, which is a necessity for the kind of work I do. This case has become part of my daily carry. The A4-size Lihit Lab Bag-in-Bag easily holds a 12-inch Macbook in a sleeve (which I'd recommend since it otherwise doesn't offer much in the way of protection. The sleeve pictured here is the excellent (and inexpensive) Inateck Cover Bag. The Lihit Lab double-sided pen case. Great, except for the fact that the smell clears a room. As much as I love the Lihit Lab Bag-in-Bag, I simply can't recommend the second case I reviewed, which is the double-sided "Teffa" pen case ($10-12 via Amazon). I can give you a quick overview regarding the build and setup, but I can't speak to durability, practicality, etc. because I couldn't use this product. Why? The smell. This pen case emits a horrifically strong chemical odor. I would compare it to oil or gasoline but I (and others, from reading the Amazon reviews) find it much more offensive. I assume that they used some sort of petroleum-based glue to hold parts of the case together. Within minutes of opening the packaging for this case I had a splitting headache. This pen case is a great idea, in principle, and should be one of those products I can wholeheartedly recommend because it looks nice and can be had for a bargain. For things like markers, gel pens, ballpoints, and any other pen you want to store in bulk and don't mind touching, this case should do the trick. The back section has pockets to store pencil sharpeners, erasers, post-its, scissors, you name it. I just couldn't get past the smell. Fortunately, Amazon refunded me (and didn't even want the product returned to them). Otherwise, this Lihit Lab pen case can carry a lot of pens. 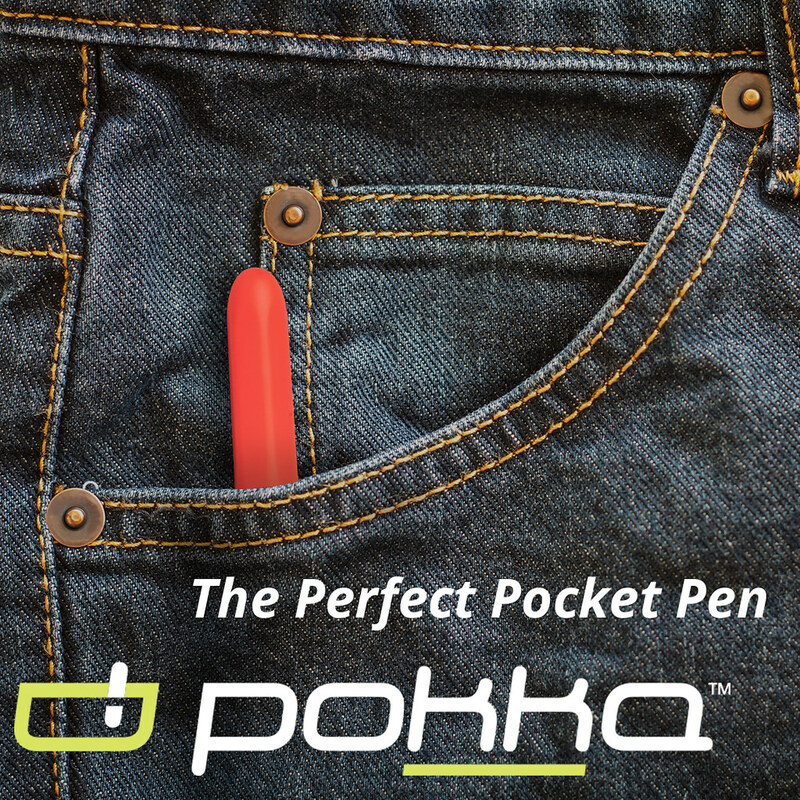 In terms of storage space for gel pens, mechanical pencils, etc., it's got plenty of room. You can buy Lihit Lab cases from either Amazon or Jetpens, which carries a wider range of products other than the cases. I purchased mine from Amazon because I have a warehouse near me in Tennessee and they qualified for free Prime "same day" shipping. I ordered them in the morning and they were at my front door by 4:00pm. Pretty cool. One more thing: I get a lot of e-mail about the pen cases I use, and what I consider the "best" pen case. While I'm working on putting together another "Top 5" list, it's been hard, in large part because everyone's needs are different. There are far more than five solid options out there right now, with more cases coming to market every day. DISCLAIMER: I purchased the products featured in this review with my own funds, for my personal use. This post also contains affiliate links. All Amazon prices and availability are subject to change, and only current as of the time of publication of this review.